“Turkey as we know it is over,” said Turkish journalist Yavuz Baydar in The Guardian (U.K.). President Recep Tayyip Erdogan has succeeded in transforming the country from a parliamentary democracy to a near dictatorship. In a referendum this week, voters narrowly approved—by 51 to 49 percent— a package of constitutional changes that grant the president sweeping powers, including more control over the judiciary and the ability to rule by decree. 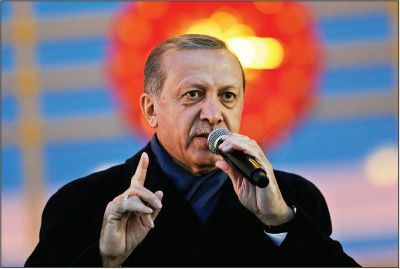 The prime minister’s office will be scrapped, and Erdogan, who has been in power as either prime minister or president since 2003, will be eligible to run for office twice more and potentially stay in power until 2029. This cements “the collapse of the rule of law” that has been occurring “in slow motion” since 2013, when Erdogan brutally cracked down on protests against his increasingly authoritarian rule. Following last year’s failed coup attempt, “an immense purge” has seen nearly 50,000 people arrested; some 100,000 police, judges, bureaucrats, and teachers fired; and independent media outlets shuttered. European monitors say the referendum was not free or fair because state media heavily promoted the Yes campaign and the election board allowed disputed ballots to be counted. Don’t be ridiculous: The Turkish people have finally “decided their own future,” said Ozan Ceyhun in Daily Sabah (Turkey). We have replaced the “anti-democratic constitution” imposed by a military junta in 1980 with one that the people have freely chosen. Yet even assuming the vote tally was correct, Erdogan’s victory is no mandate, said Semih Idiz in Hurriyet (Turkey). We are a deeply divided nation, where educated, urban Turks support secularism and democracy while the rural poor want Islamism and authoritarianism. All three major cities— Ankara, Istanbul, and Izmir— voted solidly no, as did all Kurdish provinces. That means that Turkey’s “active social, religious, and ethnic fault lines” will continue to shake the country.